How was your Labor Day weekend? Did you get some well deserved rest or gone exploring instead? Whatever it was, I hope it was a good long weekend! My long weekend was pretty darn busy but as always I managed to squeeze in some testing time. 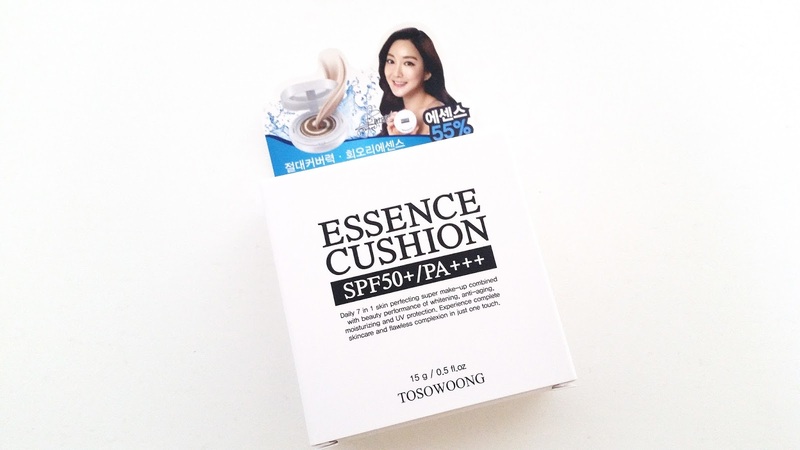 Some of the products I've been testing out lately are cushions and the latest one I tried is this Tosowoong Essence Vitalizing Perfect Cover Cushion. This cushion might look plain on the outside, but there's a surprise waiting on the inside. Let's get to know it! Product Description: The Tosowoong Essence Vitalizing Perfect Cover Cushion is a moisturizing cushion. It's formulated with 55% Damask Rose Flower Water to soothe the skin while adding extra moisture to it. Along with other nourishing extracts like royal jelly, silk cocoon, caviar, aloe and more they work together to help create a bright and glowing complexion. The cushion also offers sun production of SPF 50+/PA+++ and can help to prevent wrinkles as well. It's a cushion that completes the experience of both skincare and makeup needs to create a flawless complexion. To Use: Use the sponge puff provided to apply the cushion. Press the sponge applicator lightly into the cushion to pick up product. Gently pat the cushion onto the skin. Touch-up when necessary. Ingredients: Rosa Damascena Flower Water, Titanium Dioxide, Ethyhexyl Methoxycinnamate, Cyclopentasiloxane, Cyclohexasiloxane, Butylene Glycol, Ethylhexyl Salicylate, Isoamyl-Methoxycinnamate, Phenyl Trimethicone, Cetyl PEG/PPG-10, C12-15 Alkyl Benzoate, Niacinamide, Dicaprylyl Carbonate, SD Alcohol 40-B, Bis-Ethylhexyloxyphenol Methoxyphenyl Triazine, Dimethicone, Hydrated Ferric Oxide, Trimethylsiloxysilicate, Sodium Chloride, Methyl Methacrylate Crosspolymer, Sorbitan Sesquioleate, Phenoxyethanol, Lauryl PEG-9 Polydimethylsiloxyethyl Dimethicone, Sorbitan Olivate, Vinyl Dimethicone Crosspolymer, Disteardimonium Hectorite, Beeswax, Polypropylsilsesquioxane, Red Iron Oxide, 1,2-Hexanediol, Trihydroxystearin, Black Iron Oxide, Propylene Carbonate, Squalane, Tocopheryl Acetate, Fragrance, Trietholxycaprylylsilane, Dimethiconol, Caprylhydroxamic Acid, Adenosine, Disodium EDTA, Talc, Water, Shea Butter, Natto Gum, Royal Jelly Extract, Butyl Avocadate, Aloe Barbadensis Leaf Juice, Hydrolyzed Hyaluronic Acid, Silkworm Cocoon Extract, Ceramide NP, Tocopherol, Glycine, Saccaride Isomerate, Glutamic Acid, Lysine, Leucine, Methionine, Valine, Serine, Cysteine, Aspartic Acid, Alanine, Arginine, Isoleucine, Caviar Extract, Tyrosine, Threonine, Phenylalanine, Proline, Histidine, Sodium Citrate, Citric Acid, Tremella Fuciformis Sporocarp Extract. Packaging: The outer box and cushion has a simple and to the point design, which makes the surprise inside even more worth well. The box comes with information mainly in Korean, so I had to translate a bit and dig a bit online to learn more about it. The cushion pack itself is like the typical cushion. It comes with a built-in mirror and a sponge puff holder inside. The bottom layer is where the cushion product is housed and that's also where the surprise is. (See image below.) The lollipop like swirl design is adorable and adds a bit of fun to its simple outer design. Color: The shade I have is #21 Light Beige but the line also offers #22 Pink Beige as well. They also have a sister cushion, which is the Tone-Up cushion in #1 Pink Tone-Up. Scent: With 55% rose water included, it does smell like sweet roses. It also have a light hint of herbal scent as well. Texture: The Cover Cushion is a combination of rose water essence (white swirl) and foundation (beige swirl) mixed together. When applied, it feels moisturizing and the product adheres to the skin smoothly. Michelle's Thoughts: I used to be worried about my foundation/BB Cream shade because I'm kind of an in-between of shades #21 and #23. Depending on the brand, some are a close match while others are just a tad bit light or a tad bit dark. 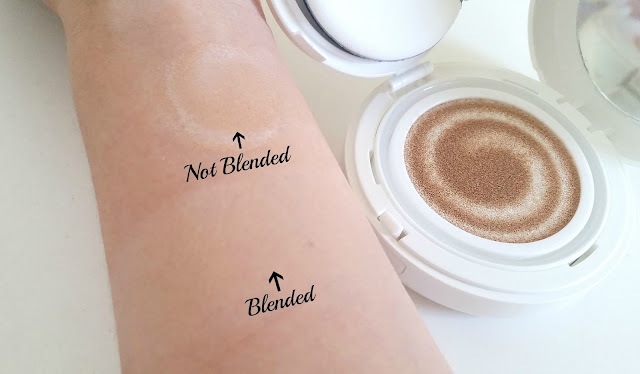 Also, I'm slightly darker in the summer and slightly lighter in the winter times, so nailing down the perfect foundation/BB cream shade for me has never been easy. I've learned that a bit lighter or a bit darker can still work for me as long as the shade difference isn't too drastic. 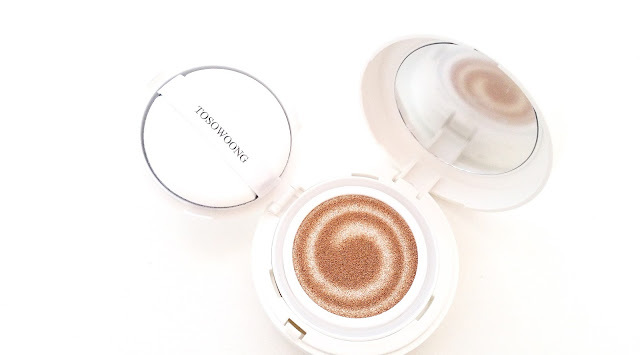 With this Tosowoong Essence Vitalizing Perfect Cover Cushion, the shade was a tad bit light but nothing a bit of bronzer and blush couldn't fix. While the shade works for me, I know the shades in this line it's quite limited and it won't work for everyone. It would be nice to see more shade options for cushions, so everyone can use it. I like this cushion. The sweet rose scent is delightful and the hint of herbal mix is quite refreshing. 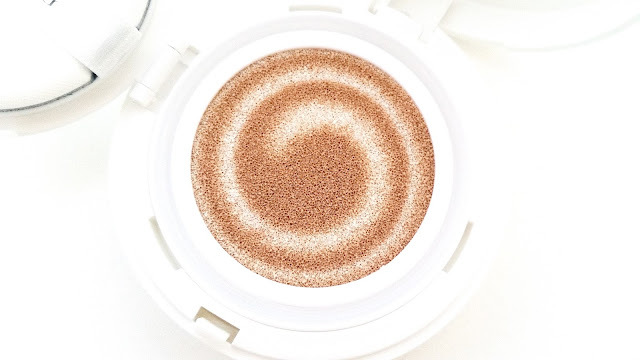 This cushion offers great sun protection and it really does brighten the skin well when applied. It feels moisturizing and light when applied, so you can layer a bit if necessary. The coverage is medium and buildable, although I wouldn't layer too much of it because it can get too unnatural looking after a while. The lasting power is decent. I can go about 5 hours without primer and almost 8 hours with primer. The downside for me is that it breaks down around the nose and apple zones easily, so I need to do touch-ups there often. Now, let's talk about the swirl the cushion has because it's what caught my eyes in the first place. It looks like the lollipop swirls and it's quite cute. Unfortunately, the swirls don't stay in place. As you can see in the picture below, the beige is already creeping into the white. With each use, the 2 colors blend more and more into each other until there's hardly any swirls left. Final Thoughts: This is a good cushion. It offers a light and temporary cooling sensation and feels soothing when applied. Its coverage is decent and it can moisturize and brighten the skin as well. Plus, it smells delightful! It's unfortunate that it has limited shades, which means not everyone will be able to use it. I do hope that they add more shades to the line. Aside from that con, the only other con is that the product seems to break down around my nose/apple zones the easiest. Which means I have to do touch-ups there throughout the day. My T-Zone and Apple zones do produce more sebum than the rest of my face, so that's a factor as well and probably won't apply to everyone. Will I purchase it in the future? I think you guys know my answer to this one already. Unless the cushion is my HG or close to it, I probably won't repurchase. Just because there are so many cushions on the market that I want to try. Do I think this Cover Cushion is worth a try? It can be worth it. If the shades they offer are a match and you don't have to worry about excess sebum breaking down the product, then try it! If the shade don't much or excess sebum is an issue, then maybe give another cushion a shot instead.